This addiction to morphine would be what drove Pemberton to invent Coca-Cola. 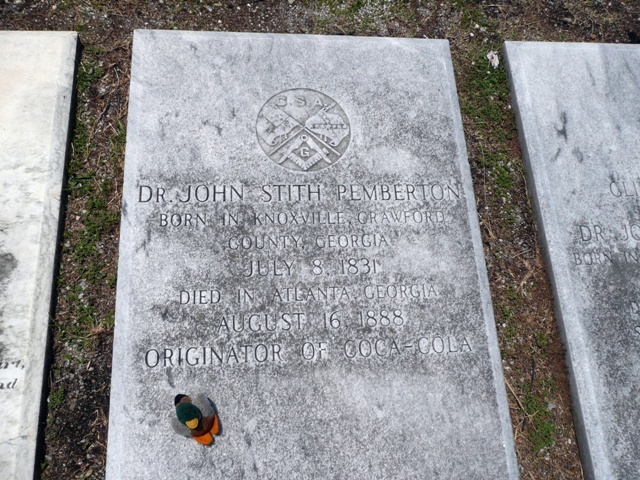 While not too many people nowadays may know who John Stith Pemberton was, almost everyone in the world knows the name of his most famous creation: Coca-Cola. The creator of the world’s most popular soft drink was actually a veteran of the American Civil War, and the soft drink he invented after the war came about as a direct result of his participation in the conflict. 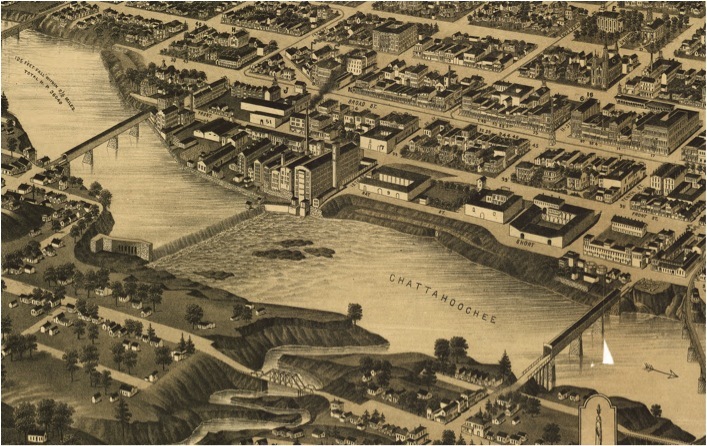 Pemberton was born in Knoxville, Georgia, in 1831. By the age of 19, he had earned a medical degree and had become quite a talented chemist. 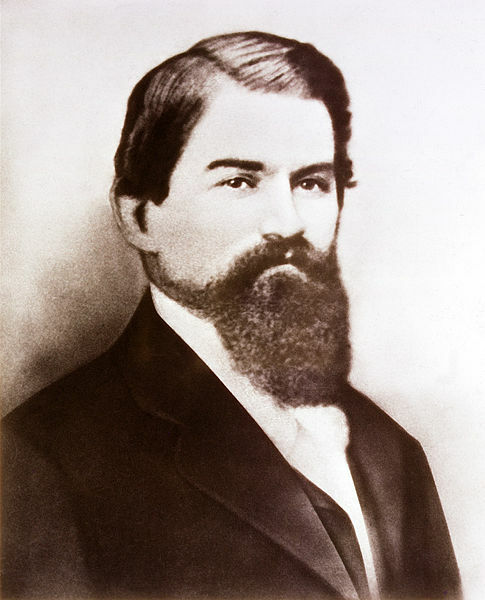 After he got married in 1853, he moved to Columbus, Georgia, where he opened a drug store and had a son. This period of domestic bliss was to be short-lived, however, for Pemberton was to become involved in the gargantuan conflict that was the American Civil War. Pemberton enlisted in the Confederate Army and was made a first lieutenant of the 3rd Georgia Cavalry Battalion. He later rose to the rank of lieutenant-colonel. During the last major battle of the war, the Battle of Columbus in April 1865, Pemberton received a bad saber wound to the chest in the struggle for control of 14th Bridge. Like hundreds of thousands of other American soldiers — both Union and Confederate — who survived the war with their lives intact but their bodies maimed by terrible wounds, Pemberton became addicted to one of the most widely-prescribed painkillers of the time: morphine. This addiction to morphine would be what drove Pemberton to invent Coca-Cola, but it also came perilously close to destroying the fledgling soft drink company before it even got off the ground. Pemberton was a talented chemist, and after realizing that his addiction to morphine was becoming debilitating, he decided to work on something that would cure him and the thousands of other Americans who were caught in the grip of this terrible addiction. He moved to Atlanta, and after much experimentation, he formulated a drink he believed would be able to cure morphine addiction. 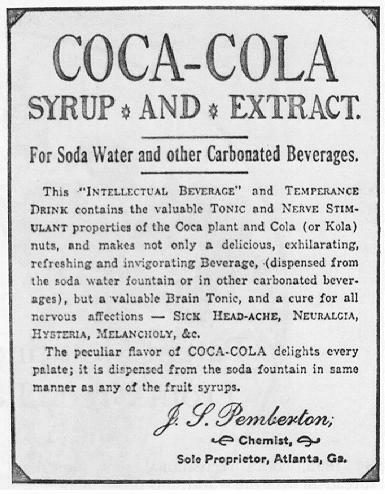 The drink Pemberton had invented, which he dubbed “Pemberton’s French Wine Coca” was advertised as a cure-all of sorts. Pemberton claimed that it could be used to treat anything from morphine addiction to depression or alcoholism, impotence, and other conditions. 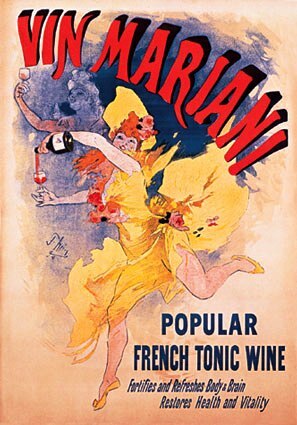 This early form of Coca-Cola was, in fact, an alcoholic beverage and was loosely based on Vin Mariani, an Italian-French medicinal wine. One of the key ingredients of Pemberton’s concoction was the coca leaf, from which cocaine is derived. While Vin Mariani also contained coca leaves, Pemberton’s drink had a few other key ingredients that the French-Italian product didn’t. There were kola nuts, which added caffeine, and damiana, a South American leaf which was used as an aphrodisiac. Since Pemberton’s drink contained alcohol, cocaine, and caffeine, it certainly would have given the user something of a buzz. When Atlanta instituted prohibition laws in 1866, Pemberton had to change the formula of his drink so that it no longer contained alcohol. He replaced the alcohol with sugar syrup and added citric acid to temper the excessive sweetness. With these alterations, the Coca-Cola we know today was almost complete, but it still lacked one key ingredient: soda water. 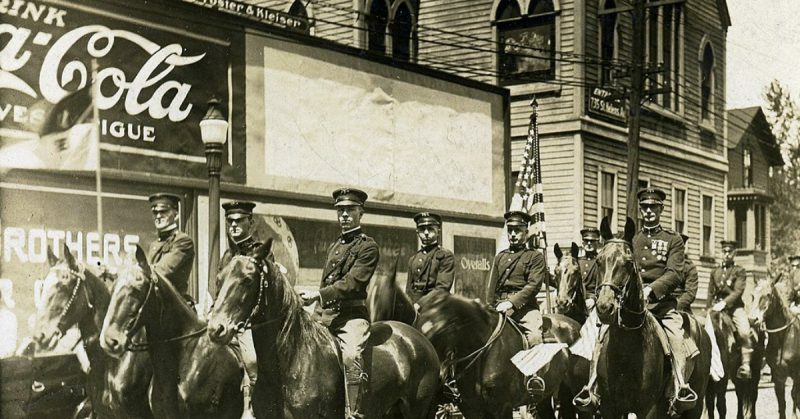 An advertisement for the Drugstore where the prototype for Coca-Cola was formulated. 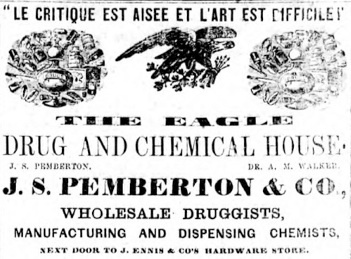 Pemberton’s new syrup had been distributed to various pharmacies throughout Atlanta and was sold as a syrup, which was then mixed with plain water to create the drink. A clerk at one of these pharmacies decided to use soda water instead of regular water, and with that development, modern Coca-Cola was born. The name Coca-Cola was invented by a bookkeeper, Frank Robinson, and was based on two of the drink’s active ingredients. “Coca-Cola,” of course, has a great ring to it, and the name quickly stuck. Unfortunately for Pemberton, while his drink had begun to achieve a measure of commercial success, it had not performed the primary function for which he had invented it – namely, it had failed to cure him of his morphine addiction. After all these years, he was still addicted to the potent drug. Running into financial difficulties, Pemberton began to sell shares in his Coca-Cola company, sometimes in a rather chaotic and haphazard manner — no doubt due to the morphine and cocaine he was using. This resulted in a number of different companies in the late 1880s all using the name Coca-Cola and all claiming to be selling the genuine product. The drink’s eventual nationwide success can largely be attributed to one of the shareholders, Asa Candler, a pharmacist who eventually ended up owning the company. Pemberton, sadly, contracted stomach cancer in 1888. While Pemberton believed that his drink could become a national hit and wanted his son at least to keep some shares in the company, he was desperately ill and needed money. His son Charles – who at this stage had developed an opium addiction – also wanted money, so father and son sold two-thirds of their shares in the company to Candler. Pemberton then passed away from his illness in late 1888. Sadly, Pemberton’s only child Charles would pass shortly after his father. In 1894, he was discovered in a coma, with a stick of opium next to his body. He died a few days later. By this time, Candler had managed to achieve complete ownership of the Coca-Cola company, and it was largely due to his genius with marketing and his sharp business acumen that Coca-Cola went on to become a national – and then international – success. Read another story from us: Was Fanta Really Invented by The Nazis? John Stith Pemberton will likely be remembered first and foremost as the inventor of the most popular soft drink in the world. But it is important to remember that had he not fought in the American Civil War, the drink would likely never have been invented at all. So, in no insignificant sense, we can say that the American Civil War was at least partly responsible for the invention of Coca-Cola.